The Sepax systems are used for automated adult stem cell banking and cell processing applications. The Biosafe Sepax system is an automated, mobile, closed unit for the efficient and consistent processing of umbilical cord blood, bone marrow, peripheral blood or other cell based products. 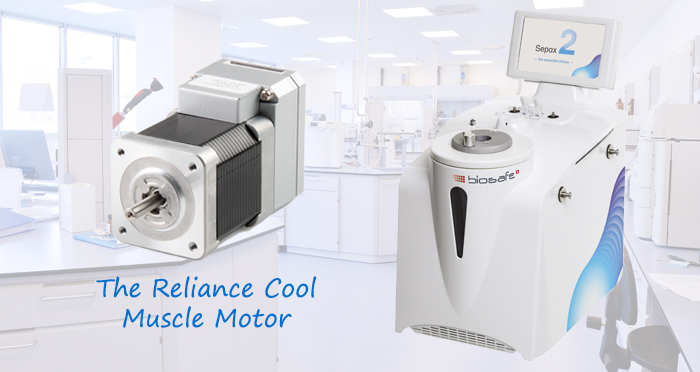 Biosafe began trialling Reliance’s Cool Muscle motors in 2010 in its Sepax systems, using the motor to help accurately separate the different cell components via single-use cell separation kits. The Cool Muscle motor senses when the different single-use cryobags are filled with the correct amount of cellular products and was so successful in trials that Biosafe continued to use it in its Sepax systems, more than 500 of which are now in use world-wide. Julien Camisani, Scientific and Technical Director at Biosafe explains: “We used to have step motors in our automated blood banking systems but this process was sometimes inefficient.